In April, the Olympia Mountaineers issued a Stewardship Challenge to all Mountaineers. With National Trails Day coming up, we want to offer a look at what we've achieved in the last two months, and once again encourage you to step up for our public lands! Here in the Pacific Northwest, we're blessed with some of the most beautiful and accessible parks, forests, and refuges in the nation. Many Mountaineers understand the value of these wild places and set aside time to give back to our public lands. In April, the Olympia Branch of The Mountaineers issued a Stewardship Challenge to Mountaineers organization wide. The purpose of the Stewardship Challenge is to engage all club members in all branches to participate in a rewarding and challenging day of stewardship. The Olympia Stewardship Committee believes this day of service will create closer connections to our magnificent natural resources, demonstrate our determination to support the public lands, and awaken a genuine spirit of service to our region in each participant. In short: we feel it's our duty to leave the trails better than before. This summer, we encourage you to step up to amplify our collective stewardship efforts! Learn more about how to get involved by reading the original Challenge blog, and read on to see successes so far and find even more opportunities to give back. 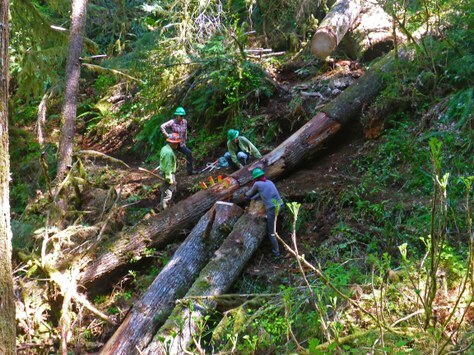 "We cleared some impressive trees and made significant improvements to the trail. It feels very empowering to help with this kind of work and I've started eyeing downed trees on other trails that I'd now like to clear." And, be sure to check out all of these upcoming activities in honor of National Trails Day on June 2, 2018. Be sure to DOCUMENT YOUR PARTICIPATION! We meed to document our hours to celebrate our stewardship efforts. If you complete a stewardship activity with The Mountaineers, the trip leader's report will automatically log your hours. If you complete a stewardship activity with with partner organizations (e.g. any non-mountaineer conservation organization, such as the WTA or a local Land Trust), please submit your hours using the Olympia Branch Stewardship Hours Report Form below. This is great. Thanks for the update!